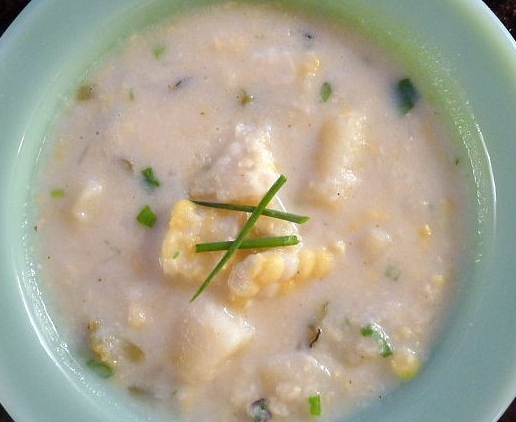 One of my favorite comfort foods all year long is corn chowder. It's also a family favorite for BBQs and I have a fresh summer version for you! Heat the butter and 1 tablespoon olive oil in a soup pot over medium heat. Add the onion, garlic, and thyme and cook until the vegetables are good and soft, 8 to 10 minutes. Dust the vegetables with flour and stir to coat everything well. Pour in the vegetable stock and bring to a boil. Add the cream and the potatoes, bring to a boil and boil hard for about 7 minutes, until the potatoes break down (this will help to thicken the soup and give it a good texture). Cut the corn kernels off the cob and add to the soup. Season with salt and pepper and simmer until the corn is soft, about 10 to 12 minutes. Stir in the parsley and give it another little drink of olive oil. Ladle the soup into bowls and serve. This can be kept warm in a crock pot plugged outside for BBQs! Enjoy your cookouts this Memorial Day fans!